A mysterious girl who lives in Arakawa. She is a self-claimed Venusian and later Kou's girlfriend. 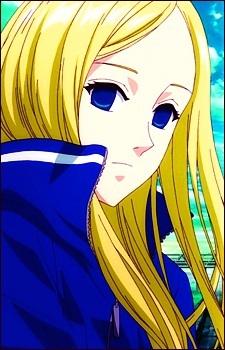 The origin of her name comes from the sweatsuit that she always wear that has the tag "Class 2-3" (Ni-no-san) on it. She is an incredible swimmer and can stay submerge for several minutes. With this skill Nino commonly goes fishing in the river and it is her job in the village to provide fish for the residents. She often forgets important information and often needs Kou to remind her. Her home is constructed of cardboard with the entrance sealed by a large curtain. Her lavish bed is made out of velvet, although she chooses to sleep in the drawer under the bed. If she becomes frightened or angry, she'll pull her sweatsuit over her head and climb on top of a streetlamp.